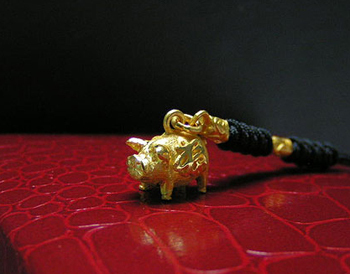 The year 2007 is the Year of the Pig, and word is that you can make a fortune in the year. Our pig-raising ancestors believed it brought luck if pigs showed up in their dream. Traders believed it would boost their business to hang a picture of nursing sow on their wall. Opening their shops on the first pig day of the year will help them make profits throughout the year. In short, pigs are symbols of luck and wealth. 2007 is specially special in that it is a "Red Pig Year," which comes only every 60 years. Red, after all, is also the color of prosperity. Industries related to childbirth and baby goods have fueled the belief that babies born in 2007 will be wealthy, as will the businesses if their bet pays off. Much the same is true for the wedding industry, which already had a bumper year in lunar 2006 because it encompasses two spring solstices. 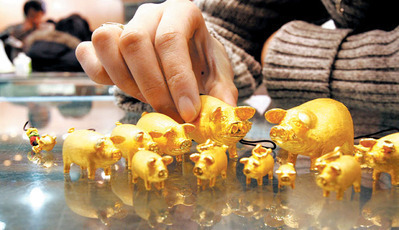 Businesses claim that 2007 is a Golden Pig Year, which comes but once every 600 years. However that may be, Korea is sure to experience a mini baby boom, in a small sign of hope for the country's dismal birthrate. Kim Eun-jeong (29), who got married in March this year, has been seeing an oriental doctor with her husband once a week since the end of November hoping to get pregnant early in 2007. "I don't believe in the superstition about the Golden Pig Year, but I want to give birth to my child in a special year. I think that I should make full preparations before I get pregnant to have a healthy baby, and I'm taking tonics and getting treatment to make my womb healthier," she says. Since November, obstetricians and nursing homes for new mothers and oriental doctors have been bombarded with requests for their services. The Mizmedi hospital, which specializes in fertility treatment, has as many as 370 expectant mothers who are scheduled to give birth in January. The figure was 337 in January 2006 and 345 on average throughout 2006. Medi-Park hospital in Bundang also get plenty of calls from expecting mothers asking if it can delay their labor until January 2007. "We got 10 such calls over the last few days. We try our best to do what they want if their due date is one or two weeks away from the date they want to give birth," a staffer said. "We're surprised that those mothers are willing to take risks to give birth to their child in an auspicious year." Luxurious nursing homes for mothers with newborns in the affluent Gangnam area are already booked up until April. Companies manufacturing goods for newborns, infant garments and formula are very well aware how powerful the superstition is. But Kim So-young, who runs the oriental clinic Ami Care, says, "Expecting parents need to pay more attention to how they can have a healthy baby, rather than jumping on the bandwagon of giving birth to a baby in the Year of the Golden Pig driven by the marketing strategy of these companies."